Progress continues to be made in our efforts to help with the education of the pupils at the schools in Sohm. Read on, for an update on our activities. This West London primary school has twinned with the Sohm Lower Basic School. There has been quite a bit of contact, profile raising and friendship building over the last four months. Sandra and John, from the charity, visited the school during Black History month and took year assemblies covering the whole school and talked about African masks. 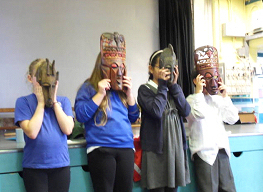 This provoked quite a bit of interest, and launched a whole school 'mask making' competition. There were some fantastic entries (a few, we suspect, with a bit of enthusiastic parental involvement!). So, we'll be back soon, to do a bit of judging and prize awarding (they are all winners!). We'll be back at the school in December running a stall at the Winter Fair, with some table top items, a raffle, and some Gambian food. This will, hopefully, maintain the interest in Sohm, and hopefully raise a little money for the schools there, from the good folk of Derwentwater. Funds continue to trickle in to the charity (and many thanks to those supporters with standing orders). All money raised will be spent, by us, on items directly benefiting the education of the Gambian youngsters (books, visual aids, a bit of teacher training, equipment etc). Particular thanks go to Elin and Paul, who arranged for a collection for the charity at their recent wedding reception. 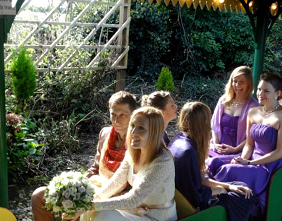 The happy couple are at the left of the photo, below, on their special day, with School Sohm Support trustee, Rose Phillips, far right in the photo - resplendent in maid of honour dress. Two Derwentwater teachers, Natalie (Sandra's daughter) and her work colleague Nicola (pictured below) will be giving up their February half term break to visit the schools in Sohm and provide a bit of teacher training for the staff. They are working hard on a pack, that they will deliver to all teachers, at both Sohm schools, with the enthusiastic support and encouragement of the two head teachers. The pack will be offered to the Regional Director of Education, for use in other Gambian schools. thoughtfully wearing a pair of bunny ears! Another couple of months and Sandra and John will be off to the Gambia, for a few weeks, working with the schools in Sohm village and ensuring that every penny raised in the UK is spent to benefit the education of local children. One of the highlights of our trip will be the project our very good friends at Football Gambia (web: www.footballgambia.org; Twitter (@GambiaSchools). Bringing 40 volunteers to the Gambia, Ian and his team will deliver a day of football training to the schools' pupils, and teacher training to the schools staff. 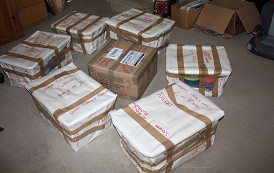 Other great friends @KitAid will be supplying kits to all the schools' hundreds of children. This is international aid at its very best: help, training, international goodwill, capacity building, friendship and co-operation. Don't know who is more excited; the kids of Sohm, the good folk of Football Gambia, or us! Some of the great volunteers from Football Gambia,'on tour' during their last visit to The Gambia. We obtained formal recognition from HMRC for the charity last November (reg number: XT31271)- which means we can get Gift Ad (an additional 25%, from the exchequer) for every £1 that people give the charity. and can be contacted via e.mail at info@sohmschoolssupport.org.uk. Keep in touch and find out how we are getting on, and spending our income! The charity has been established for less than a year, but has achieved a great deal in a short time. We hope you have a chance to look at this newsletter and to see what use we have put to the support we have been given by dozens, or possibly hundreds of people backing us. We obtained formal recognition from HMRC for the charity last November - which means we can get Gift Ad (an additional 25%, from the exchequer) for every £1 that people give the charity. We have extremely close relationships with the heads of the two schools in Sohm (the Lower Basic (primary) and Senior Secondary Schools) and their respective PTAs. We have good relationships with the country's regional director of education and a number of Gambian based NGOs. 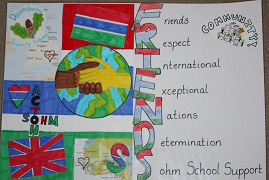 We already had close ties with the Jersey Gambia Schools Trust, who inspired us to get involved in Sohm. Since that time we have established links with two UK charities, Football Gambia and Kit Aid, who have helped and will offer great support to the schools in Sohm, in the future (see below). We are extremely fortunate to have encouraged a twinning/friendship relationship between the Lower Basic School in Sohm and the Derwentwater Primary School, in Acton (see below). We held a very successful fund-raising party, in early July; where, despite the alternative attraction of Mr Murray on the Centre Court and the pretty grim weather, we raised almost £3,000. With the assistance of Mr Osborne and one more push, we are confident we can make that £4k, gross. Fantastic, and it really did feel like a fun - raising party! In addition, we have a dozen people sponsoring individual students' education in Sohm (fees, books, uniforms etc) and have regular monthly direct payments to the charity of more than £100 per month. So, we are pretty happy - but not complacent! All offers of support, suggestions for income generation, for the future, most welcome! The twinning arrangement between Derwentwater Primary School and the Sohm Lower Basic school has resulted in a flurry of exciting initiatives. These include: us presenting to a number of year assemblies in Acton, and the school raising several hundred of pounds through a school fair, a "dress down" day, raffle ticket sales etc. The Derwentwater pupils held a very successful International Week at the end of the summer term, which resulted in some very creative work by the Acton pupils, including a song contest, production of scrap books and diaries, dancework and poster creation (see below). Children in both Acton and Sohm are enthusiastic about this link and will be exchanging course work, exhibitions, scrapbooks and letters, over the coming months. We will actively promote this excellent initiative, that benefits so many youngsters. We are now on the look-out for a secondary school link. All offers or suggestions most welcome! These links will be among the most exciting outcomes of our charity, benefiting pupils in both countries and extending the hand of international friendship and understanding. Even with the Olympics as a massive preoccupation, we haven't been complacent over the last month! Our friends at Football Gambia will be sending a container to The Gambia in September and have given us some space in it. So, we've been busy putting some of the funds raised to good use. People have generously donated laptops that they have upgraded and we have bought 10 litres of blackboard paint, brushes - so vital for an education system that is so dependent on "talk and chalk", where blackboards quickly get worn out and become almost impossible to see and use. and ready to go to The Gambia! All of this, for less than a quarter of the funds we have raised to date! We will work with the schools to ensure that all of the above is well cared-for, and is put to good and proper use. And, rest assured, every penny of the money spent - under our supervision - in The Gambia will be used to directly benefit the education and life chances of the young people of Sohm. Sandra and I will be going to The Gambia for six weeks in January (well, somebody has to do it! ), totally at our own cost, I should add. And it will be a busy time. 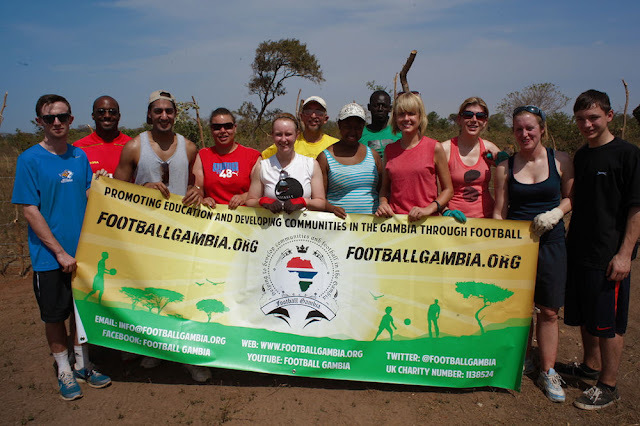 Our good friends at Football Gambia will be in the country at the time and will be visiting Sohm for a day's activity. The party of 40 will be leading some education and leadership games, offer 2 hours football skills training and run a match, between themselves and the village. They, together with our friends at Kit Aid, will be donating new/nearly new football kits to all those involved. The school are already preparing a pitch, our charity will pay for woodwork and metalwork teachers to build posts etc. It really will be like a mini-Olympics coming to the village: international friendship, skills transference, a generation inspired, legacy for the future etc. And a good time, and feel good factor will be shared by everyone involved! 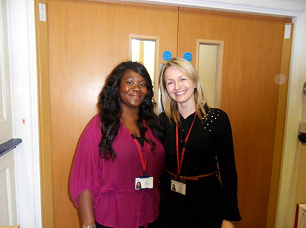 A couple of weeks later, Sandra's primary teacher-daughter, Natalie and a work colleague will go to the Gambia for their half term break and spend time working with teachers and pupils alike, in both the lower basic and senior secondary schools, upgrading skills, and hopefully inspiring teachers and pupils alike.